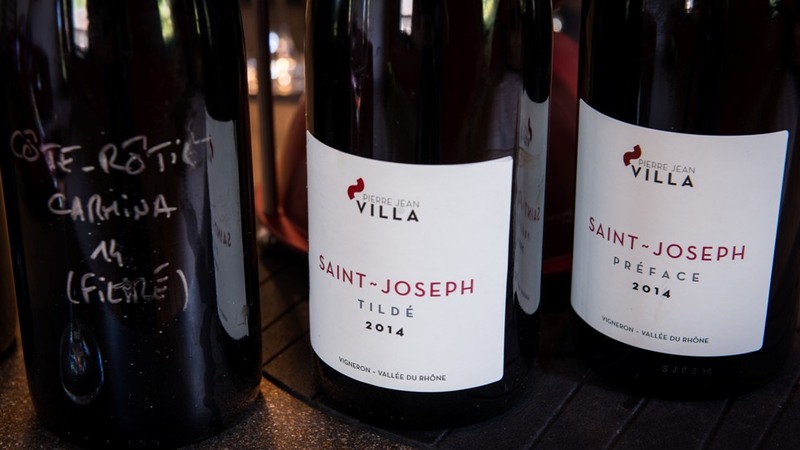 Pierre Jean Villa is a solid, well-built man, and maybe that’s why he gravitates toward elegance in wine. He came from the Rhône Valley but learned to make wine in Burgundy, which may also explain his bent for finesse. He first learned the ropes working at Mommessin’s Clos de Tart. 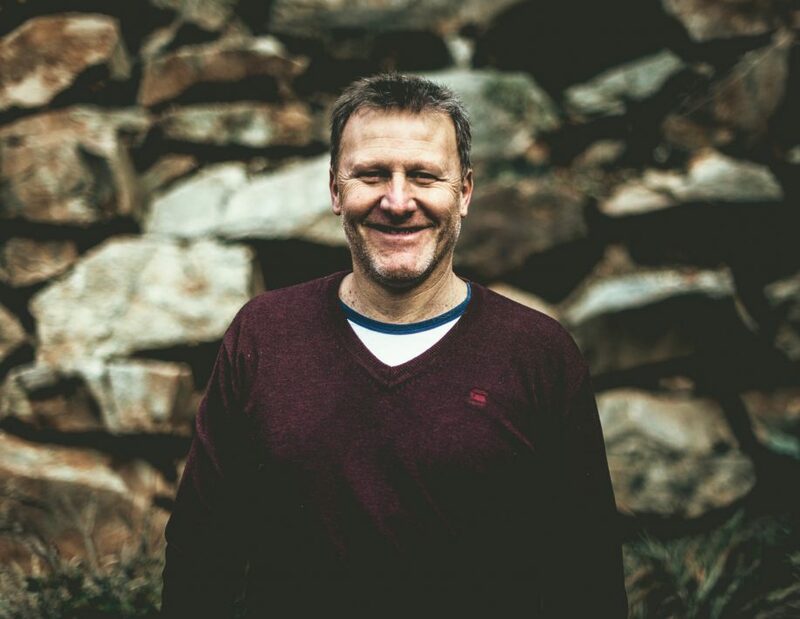 After Boisset bought the Mommessin firm, Pierre Jean worked in Beaujolais and then for three years at Domaine de la Vougeraie with Pascal Marchand. In 2003 he returned to the Rhône and became the manager for Vins de Viennes. This is the company that Yves Cuilleron, Pierre Gaillard, and François Villard created to resurrect the ancient vineyard area of Seyssuel, just north of Vienne on the left bank, as well as to do business as a négociant. For seven years Pierre Jean handled the administration and winemaking at the firm, eventually becoming the fourth partner. The other partners had their own domains to run; Vins de Viennes was Pierre Jean’s bailiwick, and he made it what it is today. 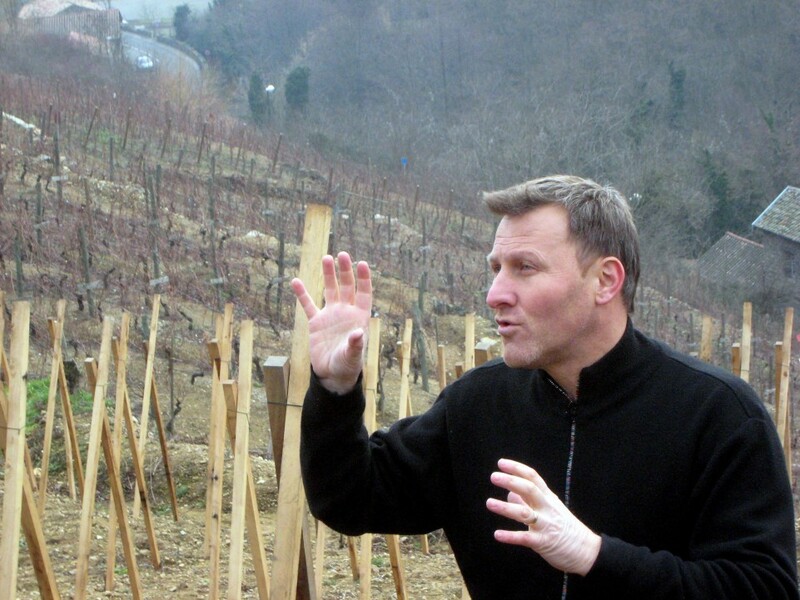 In 2009, after a lot of thought, he handed in his keys and started his own Domaine Pierre Jean Villa from scratch. He began with parcels in St Joseph, Condrieu, and Côte-Rôtie, plus he had a parcel in Seyssuel for his Esprit d’Antan. He made vintage 2009 at his buddy Jean-Michel Gerin’s domain in Ampuis and moved into a refurbished fruit processing building in Chavenay the following year. In 2013 a sharp young man named Justin knocked on his door in Chavenay to ask for a job. He had degrees in both viticulture and wine-making from Toulouse and Montpellier, and he was doing a stage with Yves Cuilleron at the latter’s nearby domain. Villa declined; he could just manage on his own. Justin returned several times and made it quite clear that he wanted to work here and no where else. Pierre Jean said okay, we’ll give it a trial run. Now Justin is a full-time employee and Pierre Jean says it’s the best decision he’s made since starting off on his own. Thanks to this persistent young man — joined recently by another one named Brian — the domain has been able to farm its 14 hectares, a mix of old and new plantations, in an increasingly organic manner and with ever more detail. Of course, it’s the details that count. In 2017, experiments are being done on the hillside parcels using a special mulch under the vines in one parcel and sowing lichen under the vines in another to see if either can replace herbicide, which would be the final step for 100% organic farming. The cellar work remains hands off: spontaneous ferments, normally no fining or filtration, and racking and bottling is done according to the lunar calendar. The domain started in 2009 with a cellar full of new barrels, but by vintage 2015 Pierre Jean managed to transition to having most of his élevages take place in older barrels. Going forward, this will be the norm, with now and again a small percentage of new replacement barrels entering the cellar. Stylistically, Pierre Jean’s wines are clean, pure, deep, mineral and elegant. Thanks to Jeff Bramwell for the first and third photos. IGP Les Collines Rhodaniennes "Gamine" Syrah This comes from two parcels of old sélection massale vines currently classed as AOC St Joseph that will be reclassified as VdP (or IGP) in 2018 under the rules restricting the total surface of the appellation. In addition, Gamine comes from young vines in Villa's other parcels. The wine was aged entirely in his oldest barrels and demi-muids. Production averages 2,400 bottles. IGP Collines Rhodaniennes "Esprit d’Antan"
Syrah The wine from Seyssuel. It comes from a tiny, south-facing parcel on the left bank of the Rhône growing in schist that dominates this side of the river (the right bank is dominated by granite). This is the ancient vineyard area that the Romans cultivated for the citizens of nearby Vienne, and may indeed have been the origins of the northern Rhône viticulture (there's no evidence that they had bridges over to the right bank in this sector, so the western side was probably left wild). Esprit d'Antan, or spirit of a past time, refers to this. What sets Seyssuel apart from Saint Joseph is twofold: its location on a broad, south-facing hill on a left bank curve of the river (similar to the geographic situation of Hermitage); and the band of schist that dominates its ground. This is the same band of schist that courses through the northern part of Côte Rôtie, passes under the river, and re-emerges in Seyssuel where it is especially dense—there is very little clay on this side. The right bank is almost all granite. Syrah on granite tends to be rounder and more generous; on schist, Syrah tends to be finer, more pointed, and more mineral. Pierre Jean de-stems all the grapes and lets the wine undergo both alcoholic and then malolactic fermentation entirely in 600-liter barrels. Starting in 2015, the alcoholic fermentation will take place in steel because a new parcel will add sufficient volume to fill a tank. Average annual production is now 3,900 bottles. Syrah The name refers to the tendrils that sprout out of very young vine leaves in the springtime and form a kind of cowlick or the curling shape of a heart. The domain owns 1.5 hectares (about 4 acres) in the Chanos Curson zone but only half is currently producing. The grapes are all de-stemmed and aged in older barrels for 12-13 months. Condrieu "Jardin Suspendu" Viognier From three parcels totaling five acres. About half was planted in 2009 while the other half dates from the 1970s. 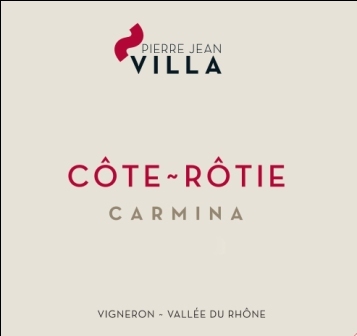 The young vine parcel was put in by Pierre Jean behind the original Villa winery on the hillside back of Chavanay; the two older parcels are in the commune of Vérin. The élevage takes place in older 500-liter demi-muids and normally there’s no fining and one minimal filtration, but this depends on the year. Pierre Jean loves the textured fruit that Condrieu amply provides and aims to couple this with lift and freshness. Production averages 1,667 6-packs. Saint Joseph blanc "Saut de L’Ange"
Roussanne A lovely, dense 100% Roussanne from a parcel in the northern end of the appellation in Chauvanay and three smaller ones in the southern end of the appellation. This is one of the few 100% Roussannes made in the north (only four or five producers make one, and indeed very few growers in the north are interested in Roussanne because it is, as Pierre Jean says, un aspirateur pour la maladie--a vacuum cleaner for illness--but he stubbornly sticks with it). The total surface comes to 0.6 hectares, or 1.5 acres. It’s made mostly in 600-liter demi-muid barrels and even this white wine is normally bottled without filtration. The name—Angel’s Leap, or Swan Dive—comes from the parcel growing on a steep hillside that ends at a cliff above the winery. Production averages 1,500 bottles. Saint Joseph "Préface" Syrah This is the first red cuvée of the domain, a wine with a terrific core of Syrah fruit, and it sets the tone (hence its name). At roughly 12,000 bottles, it’s the largest production. This is made in a mixture of 225-liter and 600-liter barrels, all older, and the élevage goes for 12-13 months (which will probably increase in the years ahead). The vineyard parcels total two hectares, or five acres. Syrah This is the old vine cuvée made from four parcels planted in 1963, 64, 65, and 1970 in the northern part of the appellation, all growing at roughly 300 meters in altitude. Total vineyard surface is one hectare, or 2.5 acres growing in sandy soils on top of a mother rock of pure granite. Depending on the year, some is declassified into Préface. Like its sibling, this is made in a mixture of large and small barrels, but here the élevage goes for up to 24 months. Pierre Jean’s father came from Spain, and the word Tildé refers to the Spanish accent mark ˜ which forms the logo on Pierre Jean’s labels. In the old dialect of Occitane, Tildé refers to an inscription, a stamp or seal put upon an object, and this cuvée could well bear the seal of the domain. Average annual production is 3,000 bottles. Syrah Pierre Jean has two parcels in Côte-Rôtie for this wine: an old vine parcel (1959 and 1964 plantings) measuring 0.5 hectare, or an acre and a quarter; plus 2 hectares, or five acres, of younger vines in the northern half of the AC. All of this is Syrah except for two lonely vines of Viognier that somehow got planted by accident, and these grapes are tossed into the vat. Carmina is the proprietary name of a cuvée that is made primarily with old vine grapes and fermented with 30% or so of whole clusters. The élevage is done in a mix of small and large barrels, and bottled if possible without fining or filtration. This wine has a great deal of breed. Average annual production is 3,600 to 4,800 bottles. Côte-Rôtie "Fongeant" Syrah Fongeant is a lieu-dit at the top of the Côte Brune hillside. Villa has a parcel of just over an acre planted in 1954, and since 2013 he has plowed this parcel with a horse. Depending on the year, the wine is made with between two-thirds and 100% whole cluster after a strict triage and is not fined or filtered. Elevage takes place primarily in older demi-muids, with a few 228-liter barrels in reserve. Production averages 2,400 bottles. The vines pre-date clonal selections. They are not the small berry serine strain of Syrah; rather, these vines constitute an old sélection massale plantation. Each vine is distinctive, there is little rhythm or reason about them, and their grapes range from small to large.